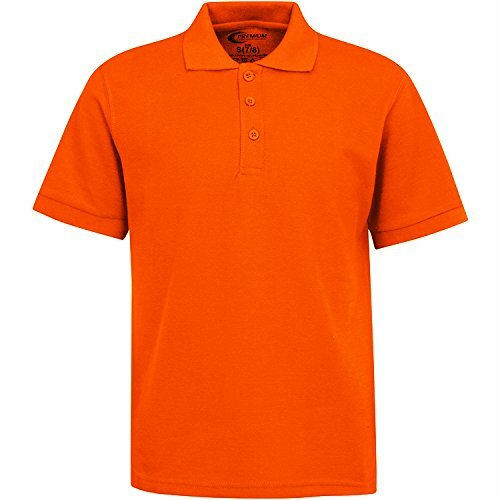 Boys Uniform Polo Shirt Orange M 10/12 by Premium at Mas Fashion. Hurry! Limited time offer. Offer valid only while supplies last. Do you struggle to find a perfect school uniform shirt every year? Or Do you compromise on the color and size of the school uniform? Not anymore! Do you compromise on the color and size of the school uniform? Not anymore! We bring to you the finest quality school uniform polo shirts. The fabric of these polo shirts is highly breathable and comfortable. The material is not thick or heavy to ensure comfort during even summer days. What could be better than a stylish polo shirt that is designed for comfort and a perfect fit? We have designed this polo shirt for easy cleaning, so it makes your job of cleaning easy and quick. These cotton/poly blend half sleeve shirts are perfect for boys school uniform. We also offer you 100% risk-free satisfaction guarantee to let you buy with confidence; no questions asked. However, we are quite sure that you would be very satisfied with this polo neck shirt and will always get back to us only to buy your school uniforms. ORDER NOW to get this stylish polo shirt and get a comfortable and perfect fit school uniform for your boy. ★ PREMIUM QUALITY - You don't have to compromise with mediocre quality school uniforms anymore. We bring to you a premium quality short sleeve school uniform for boys. These polo shirts are designed using pique knitting which gives it a stylish look and a comfortable feel. To put it simply, it offers an impeccable combination of material, design, and colors. ★ A WIDE RANGE OF COLORS - Our school uniform polo shirts come in a wide variety of colors to let you pick the one required for your uniform. Hence, no more struggle to find the right color or running around in different stores for one. These polo shirts are definitely going to make a permanent space in your boy's wardrobe. ★ A RANGE OF SIZES - Along with color options, these polo shirts come in a range of sizes, so you don't have to worry about looking for a perfect size. A perfect fit means you don't have to compromise with an elderly size fit that looks out of fashion or a small, or a tight fit that makes you uncomfortable. You get a perfect size and fit, that too with stylish looks. ★ STAIN RESISTANT AND EASY TO CLEAN - These polo shirts are made up of a material that is stain resistant and doesn't allow dirt to settle easily in the pores of the fabric. Also, being a durable material, it could either be hand washed or machine washed. These incredible features make these polo shirts definitely one of the most preferred choices. ★ 100% RISK-FREE SATISFACTION GUARANTEE - We offer you 100% risk-free satisfaction guarantee to let you buy with confidence; no questions asked. However, we are quite sure you will love the quality of these polo shirts and also the comfort they bring home due to their stain resistant design.